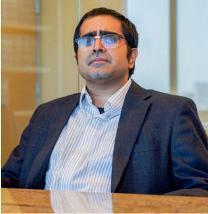 Abhay Khosla practices in various areas of corporate and business litigation. He specializes in commercial litigation, business litigation, defamation, slander and libel, business torts, labor and employment, intellectual property, real estate, entertainment, trademark and copyright, trusts and estates, personal liability and malpractice, sports and music. Mr. Khosla is currently the lead associate of Sherman Law Group. Mr. Khosla attended the University of Michigan, where he earned a Bachelors of Science in Biochemistry in 1998. After graduation, Mr. Khosla attended the University of Southern California Law School, where he earned his Juris Doctorate in 2002. Mr. Khosla was admitted to the California State Bar of California in 2002. Subsequently, he was admitted to the U.S. Patent & Trademark Office Patent Bar in 2006. Mr. Khosla has been published in the Los Angeles Lawyer Magazine numerous times, including: "The Royal Treatment" and "Where Credit is Due", for which he was displayed prominently on the cover.